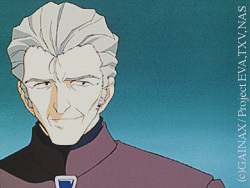 This man runs NERV in Gendo's absence. He is a very calm man who has known Gendo the days he was a science professor and Gendo was a trouble-making college student. He also seems to be more slightly more popular among the people in NERV. The acquaintance with Gendo actually stems from a rivalry which had started while Gendo was in college and continued after the object of the rivalry (Yui, Shinji's mother) sided with Gendo. Kohzoh, however, is an incredible scientist and a brilliant thinker, and he proved it when he confronted Gendo. Gendo realized this and took the mentality of keeping his enemies closer, which is why he took Kohzoh on as his second-in-command. And yet, despite the rivalry, it seems that Kohzoh is also privy to Gendo's secret agenda.